I bet it has been twenty years since I had a meal at the Red Sails Inn. Today two members of my widow support group – Irene and Candy – and I decided to get together for brunch and go up to the cemetery to visit our spouses. We usually go somewhere in Ocean Beach, but wanted something different this time so, after looking at the “Beacon” list of top restaurants, we decided to try the Red Sails Inn. The first thing I noticed was that the “musty” smell that I remember from twenty years ago was gone. The restaurant hadn’t changed much nor had the menu. The breakfast menu consisted of approximately 20 items, plus a number of different kinds of omelets and side dishes. The price range was from $4.95- $11.95. The lunch menu had 8 kinds of burgers, 13 different sandwiches, 2 soups, and an array of seafood dishes, as well as salads. Candy was not as hungry and she ordered a bowl of steaming hot clam chowder – $3.95 – and a bowl of coleslaw for $1.75. She said that both the chowder and coleslaw was good. 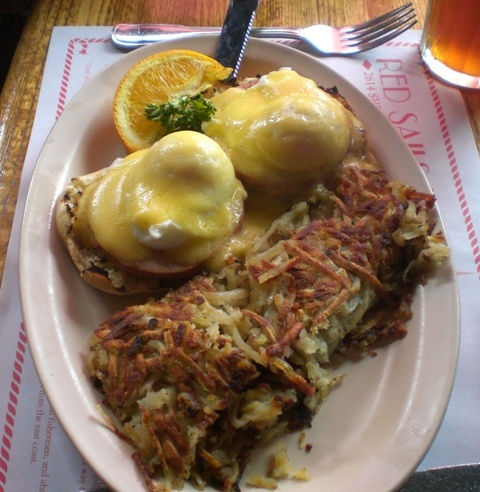 I ordered the Eggs Benedict – $9.95 – and had my choice of hash brown potatoes or homemade fries. 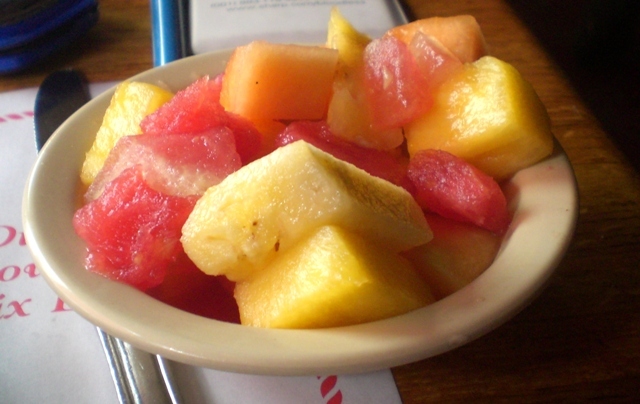 I first ordered the hash browns, crispy, but later changed the order to fruit instead of potatoes. When my order arrived, the switch had not taken place and there were very crispy hash browns on the plate. Debra quickly brought me a bowl of fruit, and left the potatoes. We were a little concerned that three people that came into the restaurant after us placed their order at least 6 minutes after we placed ours. They were served first – different waitress – and we were prepared to have our order served to us cold. That was not the case. Even though the three ahead of us were almost finished with their meal before we were served, our food was hot and tasty. The ham on my Benedict was a nice slice, and although not piping hot, was palatable and I did not ask to have it reheated. 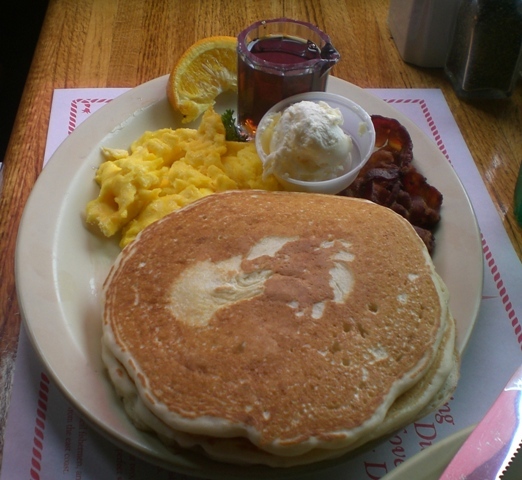 Irene’s pancakes were also just on the border of warm/hot, but she said they were delicious. The view out the window was delightful and even though it was too cold to eat outside, we felt a coziness inside the restaurant. Debra asked us several times if everything was ok – it was – and the three of us had an enjoyable meal. Would I go back to Red Sails Inn? Yes. The total bill came to $29 without the tip; the food was good and the view spectacular. In spite of the initial slow service, we were not unhappy with any part of the meal. I like this place. On Yelp it gets no love and honestly I don’t understand why. Yeah it’s outdated and in many cases I think that’s a good thing. The place reminds me a lot of the restaurants I used to go to with my family in the Redondo Beach harbor area back in the 70’s and 80’s. Actually it sounds good right now. I may have to stop there on the way home from work for a cold beer and a couple fish tacos. Also you should review Fiddler’s Green just up from there in the near future.